The mission statement on the MOM’s Organic Market website says it all: “Our purpose: to protect and restore the environment.” And what better way to protect the environment, than to support organic agriculture? MOM’s, which operates 10 stores in Maryland and Virginia, was one of the most passionately endorsed nominees for our Top 10 Right to Know Grocer’s Contest. And no wonder. The company chooses organic products whenever possible, stocking an overall higher percentage of organic items than any other major grocery chain, and selling only 100-percent USDA Certified Organic Produce. MOM’s commitment to the environment and reducing the company’s carbon footprint is reflected in many of its policies, including operating 100-percent wind-powered stores, providing a green benefits program for employees, eliminating plastic bags at check-out counters as part of the company’s plastic surgery program, and bringing the company’s recycling rate to 85 percent of total waste. A full 100 percent of MOM’s produce sales are certified organic, and roughly two-thirds of store sales are organic – an amazing feat for a grocery chain of 10 large stores. In July 2012, MOM’s informed suppliers that the company would no longer accept foods with high-risk GMO ingredients, and that products with containing suspect ingredients had to be either certified organic or Non-GMO Project verified. Q. When did you take action to protect your customers from GMOs? A. We had an unspoken stance for a while. As of July 2012, we began a more thorough investigation for approving new products with high-risk GMO ingredients such as corn, canola, soy, beets and cotton. A. As Prop 37 gained momentum last fall, we amped up our efforts to reformulate our purchasing policies to reflect our position on GMOs. We continue to emphasize the importance of protecting organics, which has always been part of our mission. Working with The Non-GMO Project has facilitated our leverage when working with vendors and reviewing product lines. The non-GMO project offers third-party certification and labeling, which eliminates additional questioning on our end. Very helpful! A. The most difficult part is paying attention to not just corn in a product for instance, but also paying attention to derivatives like maltodextrin, ascorbic acid, etc. It’s also been enlightening to work with manufacturers and retailers who aren’t aware about what ingredients might be genetically modified, and educating them on how to avoid such ingredients or get the ingredients tested. Education is incidental, and happens as we discuss our GMO concerns with vendors. If GMOs are not on their radar, our concerns bring GMOs to the forefront. Vendors learn that retailers such as MOM’s have GMO policies and that it affects what products we will and will not sell. Q. Please share a few stories about your success in persuading manufacturers to remove or replace GMO ingredients in their products. A. Most of our success has been with local vendors. Ester’s Granola, for example, was using canola oil in the granola. When we explained that we wouldn’t accept it with the non-organic, GMO-risk canola they began testing coconut oil and have now transitioned the entire line into coconut oil. We they switched, we began to carry the brand. Our Regional Grocery Coordinator is currently working with a chip vendor to change from canola/corn oil to sunflower/safflower oil. It’s still in the works! With larger companies it’s been tougher to effect change. But by standing firm in demanding organic or third-party certification we are ‘voting’ with our dollars. Q. What customer feedback have you received about your GMO policies and practices? A. Positive and negative. Many customers are thrilled we are making efforts and feel all the more confident shopping at MOM’s as a result. Other customers are frustrated that manufacturers do not label GMOs already (and we share that frustration). Some customers are disappointed when they can’t find an item in our stores that they like. But they typically understand and appreciate when we explain our reasons for not carrying it. Our leadership team is discussing ideas for how to communicate GMO-based product changes with customers. Q. What tools could OCA or the natural foods industry provide that would help you and other grocers keep GMOs out of the food supply? A. Keep pushing organics. We see a trend that brands are considering non-GMO more important than organic and we thinking that’s the wrong message. Organic means that it can’t be GMO or GE, which alleviates the need of having verified non-GMO. Organic is much better for the environment. We’re seeing brands that are organic and don’t have high potential GMOs going through verification because that’s what they believe the customer wants. If something is USDA organic then by definition it cannot be genetically engineered. This tells us that we need to do more educating of both customers and manufacturers. Anecdotally, brands used to come in and the first thing they would say is, “look, it’s organic!” Now they come in and the first thing they mention is, “look, it’s non-GMO.” It would also be helpful to have a standard, across-the-board definition of “natural,” and whether a product labeled “natural” does or does not allow GMOs. Q. What would you like to tell other grocers thinking about taking products with GMO ingredients off their shelves? A. That it’s a daunting task! We’ve been able to eliminate non-organic potential GMOs when we have an organic alternative. For instance removing non-organic canola oil in favor of just carrying organic, and also regular milk yogurt. But by no means are we close to eliminating all, and we know of no grocery store in the country that can say any different. Still, overall customer response has been positive, and we see vendors trying to adjust to stay relevant. On Mission and Values . . .
A. Our purpose: to protect and restore the environment. We make our decisions based on that purpose, a purpose our customers value and trust. We only offer 100-percent USDA certified organic produce. We are 100-percent wind powered as of 2005. We offer free electric car charging at many of our stores. We have in-store recycling for customers and free tire inflation before winter. Our customers often tell us that our customer service is extraordinary, which keeps us striving to offer more and better services to our community. Q. Describe your store’s mission and values. A. Our Purpose is to protect and restore the environment. A. MOM’s purchasing policies reflect our values and purpose in a variety of ways. For instance, MOM’s only sells sustainable seafood based on “Best Choice” recommendations from the Monterey Bay Aquarium Seafood Watch. We also encourage vendor products that contain palm oil to use Roundtable on Sustainable Palm Oil (RSPO) palm. RSPO is an international multi stakeholder organization and certification scheme for sustainable palm oil. Our produce department sells only 100-percent USDA Certified organic produce, and chooses to work with local farms that maintain the native ecosystems and forests on their property and implement practices that promote beneficial organisms and biodiversity. These farms include Mother Earth, Claggett Farm, Lady Moon Farm. We sell heirloom seed varieties in the spring to preserve traditional varietals and source as much local honey as possible to support the pollination of local flora. For honeys originating from other parts of the country, we ask for purity testing to ensure that it includes pollen from the particular varietal. Q. What are your store’s goals? A. 1) To educate customers and our communities about protecting and restoring the environment. 2) To continually increase our organic offerings, by bringing in organic products whenever possible. 3) To have an impact on the grocery and retail industries by sharing our environmental policies and encouraging them to adopt similar policies. Personally speaking . . .
Q. What do you find most enjoyable and gratifying about the retail grocery business? A. Learning about the industry, interacting with customers, offering stellar customer service, having the opportunity to learn and educate about the environment and organics. Q. How did you get interested in natural foods retailing, and what keeps you in the business? A. Scott Nash started MOM’s in 1987 at the age of 22 with an initial investment of $100. MOM’s was originally called Organic Foods Express (OFE) and operated as a home-delivery/mail order company out of Scott‘s mom’s garage. Eventually, as the retail aspect of OFE increased, the delivery/mail order was phased out. OFE eventually opened to the public seven days a week for retail sales and soon changed the name to My Organic Market and then MOM’s Organic Market. Our niche is high quality organic produce, fair prices, and exceptional customer service. Many companies have huge marketing budgets, the cost of which they share with their customers by raising prices. MOM’s rarely pays for advertising and mainly relies on word of mouth. We pass the savings on to our customers. Our Regional Grocery Coordinators work hard to buy product in quantities that suit a company of our size, and we share those savings with our customers as well. Lastly, we don’t overcharge our customers! What keeps us in the business is our desire to uphold our purpose and simultaneously, our relationship with our customers. We strive to provide our large customer base with responsible grocery choices at good prices, to make their shopping experience the easiest it can be. A. We love hearing from customers! Our owner, Scott Nash, is available by email (scott@momsorganicmarket.com) and phone (301.767.9433) for any question, concern, need, or comment that our customers may have. Our customers have great ideas and we want to hear from them all. In the heart of the Berkshires in Massachusetts, there is a unique market and delivery service that has been actively pursuing a mission to provide their customers with sustainably grown, clean, and healthy food. 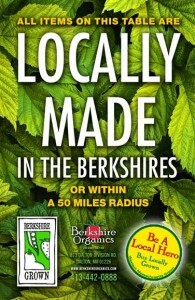 Berkshire Organics began as a small local and organic produce delivery service out of owner’s Aleisha & Brian Gibbons home. Armed with a passionate vision, they have quickly grown the business into a successful market on the Pittsfield/Dalton line. The deliveries continue year-round to several hundred county residents each week. While growing the market and delivery service, Aleisha & Brian helped mentor Pamela Denholm on how to start her own produce delivery service, South Shore Organics, for residents in the South Boston area. South Shore Organics has successfully grown in its first three years and is also getting ready to open a market. But Aleisha & Brian didn’t stop there. They also started a local school delivery program which they are in the process of converting into a 501(c)3 non-profit. With the help of a dedicated and knowledgeable staff, Berkshire Organics has become the go-to shop in Berkshire County for foods that are free of GMOs. They are currently trying to educate their customers on the abundance of GMO sweet corn in the local area through their weekly newsletters. They also work closely with many local farmers on trying to tackle livestock processing and non-gmo feed issues as well as work with food vendors, using a stringent vetting process to impress upon them the importance and marketability of organic and non-GMO products. Berkshire Organics was recently selected as one of the “Diligent Dozen” Right to Know Grocers. Here are excerpts from an interview with store owner Aleisha Gibbons. Q. Roughly what year did your store decide to take action to protect your customers from GMOs? A. We started to add more grocery items to our market in 2010. Because our goal is to carry predominantly local and organic products we wanted to be careful about the grocery items we offered. We began to read more about GMOs and decided we wanted to offer the cleanest foods we could find. One staff member in particular embraced learning all she could about GMOs. The more she learned and shared with the rest of the staff, the more obvious it was this was something we couldn’t ignore. We wanted to be proactive. A. Knowing whether or not to trust food companies or sales representatives who say their product is non-GMO, when the product is not verified and you see conventional probable GMO ingredients listed on the ingredients label. Also, we worry about losing business. We have eliminated some popular items and replaced them with cleaner alternatives. We do our best to explain to the customer why we no longer carry that particular item but you always worry that you could lose their business. In most cases, the customer is very appreciative and that helps to build trust and loyalty. Q. What’s your position on GMOs and livestock feed as they relate to your local and regional meat and dairy producers? A. This is still a difficult topic for local farmers in our area. There is basically one locally produced feed that many farms use. We know the feed is most likely GMO. The farmers tell us that if they switch to an organic feed their costs will double. Fortunately, many farms rely on their own organic pasture. But we have not seen any farms switching to an organic, non-GMO feed just yet. This is a topic that our GMO screener brought up with Jeffrey Smith when she attended a GMO workshop run by him. He acknowledged the difficult position we are in – supporting our local farmers is such high priority for us. Jeffrey’s response was that we should absolutely keep working with the local farms because even if they are using some GMO feed the products that we get from them are still vastly superior to conventional meat and dairy. Q. Please share a few success stories in getting manufacturers to remove/replace GMO ingredients in their products. A. When we did an overhaul of all the items we carry, and looked at all the ingredient lists for every product, we realized we would need to contact many local food makers with our concerns about GMOs. Several of them were confused and did not know about GMOs. There were several, however, who did take action. One local granola maker from Bola Granola switched the canola oil she was using. Since then she has added other products to her line and is marketing them as non-GMO. This was reassuring for us to see. Q. What customer feedback has your store received about your GMO policies and practices? A. At first customer response was sort of quiet. We think customers were trying to understand this very difficult topic. We really tried to educate our customer base with articles and information through our e-newsletters, printed newsletters and through social media. Suddenly customers started to talk to us more about GMOs. Some got involved and organized rallies and protests. Now customers seem very appreciative of the work we have done and continue to do by keeping them updated on the subject. A. We’re not certain we can trust products that we’re told are GMO-free, but that don’t have the non-GMO project verification. For example, the Kind Bars have been an item we have not brought into our store, even though they say non-GMO on the wrapper. When you look them up on the Non GMO Project website https://www.nongmoproject.org/ you see that only their clusters are listed. The bars are not. When we met with a sales rep from the company he did not know much about GMOs. We explained our concerns about conventional soy lecithin and natural flavors being listed in almost every bar. He said they were in the process of getting them verified. But he never got back to us with proof or a certificate. So we remain uncertain about this item. We’d like to see some stricter policing somehow. OCA does a great job of calling companies out and doing undercover work so perhaps this is something they could assist with as well. One of the things that has been most helpful to us, that OCA spearheaded, was their education on large corporations who own organic brands and who fought against the mandatory labeling in CA. We took action immediately and eliminated many of the brands from our shelves. Q. What advice do you have for other grocers who want to keep GMO ingredients off their shelves? A. Education is the key. There is a lot of information out there to read and absorb and the information changes almost daily. It’s important to have staff members who are dedicated to this mission. These staff members need to work closely with the folks who place orders and decide what products to bring in. It’s important the owners and managers are also on board with the strict non-GMO policy and that they understand what to look for as well. There have been many times when I, as the store owner, was almost talked into a product by a sales person until my staff member reminded me about the GMO derivative ingredients. At that point, we decided against the product. On Store Mission and Values . . .
A. Our main emphasis has always been local and organic. We offer the best variety of local produce and value-added products in the area. We work with over 50 local farms and small businesses and deliver over 250 baskets each week full of produce and grocery items to homes and businesses. We also offer a full market so customers can pick up their baskets and do their own shopping. We operate year-round. When our local farmer’s markets shut down for the winter, we keep going. Not only do we not bring in new products that may have GMO ingredients, but we have gone through our entire market and found better, cleaner alternatives to many items that have conventional dirty-dozen and/or GMO ingredients. There have been many popular items we eliminated from our shelves because we found organic alternatives that we could offer instead. We have discontinued many organic brands owned by large corporations such as Knudsen, Santa Cruz, Muir Glen and Cascadian Farms, to name a few. We have some large organic corporate brands still on our shelves because we haven’t been able to find a smaller, independent company that offers an alternative. As soon as one does become available, we mark the large corporate brand on sale to move it out and bring in the better alternative. Q. Tell us about your store’s mission and values. A. Our mission is to link local residents with local and organic farms by making these foods more accessible through our customer-centric, year-round delivery service and a market that is open seven days a week. Truth, transparency and trust are our core values. A. While we are in business to stay in business, we do not sell items based solely on profitability. We are not afraid to discontinue items and lose some business as a result. We do our best to educate our customers on why we make the purchasing decisions we do so they have greater trust in us and feel safe buying the products we sell. Our aim is to help alleviate the consumer’s confusion over which items and brands are the safest. We do all the research and background work so the customer doesn’t have to. Q. What are your current store goals? A. To find better alternatives for some of the items we put GMO warnings on in the store and on our website. We have a small list of items for which we are looking for clean, organic alternatives, and we hope that these items will enter the marketplace soon. Q. What would you like OCA to communicate to Monsanto and its GMO allies on behalf of your store and customers? A. If you want a piece of the organic pie, which you obviously do by owning organic companies, than please stand behind organic and make your foods clean and transparent by labeling them if they do contain GMOs. Stop being hypocritical by selling organic products and then spending thousands and millions of dollars in advertising and marketing to confuse the masses on why they shouldn’t vote for their right to know about GMOs. Q. What aspect(s) of retailing do you find most enjoyable and most gratifying? A. Customer appreciation and feedback is always the best. When customers thank you for looking out for their best interests and tell you to keep up the good work, that’s what keeps you motivated to keep pushing. Our food system in the U.S. is a very complicated and tangled web. The average person does not have time to research and educate themselves on who owns who, who supports GMOs, etc., so it has been very rewarding to help bring some of this information to our customers in a way they can better understand. A. There is a definite need for truth and transparency in our food system in this country. Small, independent businesses like ours can thrive because customers respond to retailers that they perceive as trustworthy. Many people realize that large corporations may not always have the best interest of the consumer in mind. Many times those corporations are driven by profit instead of doing what is best for the public. Q. What else would you like to share about your store with OCA readers? A. When all the other stores and markets in our area were being quiet on the GMO issue, we tried to bring as much attention to it as possible. We were the first in our area to sponsor the film, Genetic Roulette, to a sold-out crowd. We helped sponsor several GMO rallies and protests, not just by attending them but through advertising and marketing. We have attended several meetings with our local government representatives to try and bring the GMO issue to the forefront, especially when many of them were not even familiar with the term. We tried for a long while to get our local newspaper to write a story about GMOs and we succeeded. It’s exciting to see more and more people talking about GMOs and wanting to take action.